Silly or Smart Shillelaghs! A St. Patrick's Day Social Situation Game! It always amazes me how instinctually people react in various social situations. Recently we were shown in "Elevator Experiment" (click HERE if you haven't seen it) in one of my classes and it really drove home the idea of appropriately reacting to social situations. Our students may need some help in this area, and their instincts on how to react in social situations may need some tweaking. 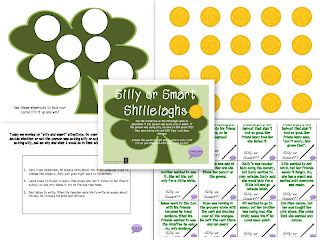 To work on this I created "Silly or Smart Shillelaghs" just in time for St. Paddys! You can use this as a game to teach appropriate responses to common social situations! Have your students read or listen to the situations on each shillelagh and then determine if the person was acting silly or smart. If they were acting silly, have them explain why and what they would do in that situation to be smart! This cute game pack includes the questions, a game board, coins, and a take home worksheet! Download it HERE from TpT and get crackin'!